Begonia PHOE’s Cleo ??? I am not positive yet if this is the correct name, But it maybe a seedling or hybrid from this plant.? I got this plant from Tim Anderson who ran an amazing nursery in South Miami called Palm Hammock. Tim collected and breed a lot of Begonias and this one caught my eye years ago. The main attraction for me was the fuzzy or hairy stems. This plant has some of coolest stems I have seen. Growing to 2 feet tall and 2 feet wide when mature. 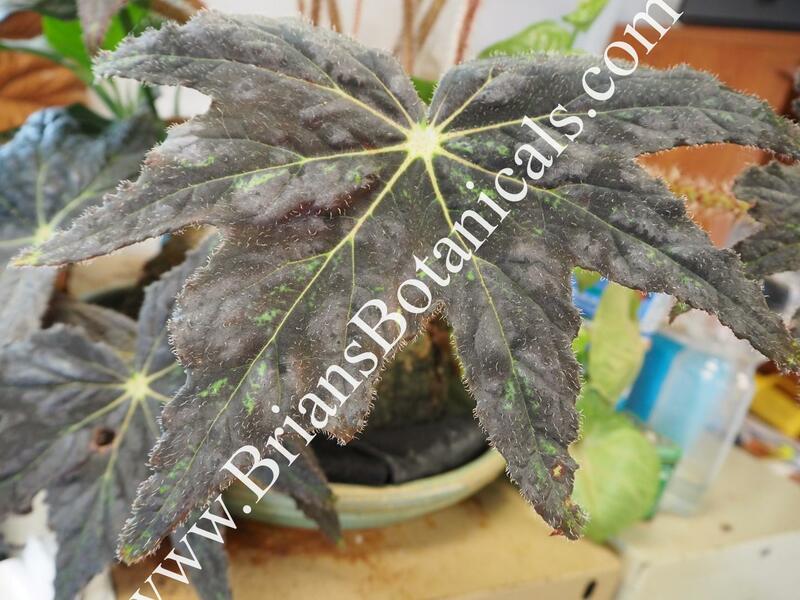 Begonia PHEOs Cleo has large leaves up to 8 inches or more across. I found that in the greenhouse the plant grows with dark almost black leaves and fuzzy stems that are pink with markings. In the greenhouse in more sun the leaves are bright yellow to green with bright pink fuzzy stems. So the plant looks completely different depending on how much light it is receiving. ? This makes an excellent house plant container plant. Usually in limited stock.